I’ve long been known as the “cavalry guy” due to my ongoing fascination with the horse soldiers of the Civil War. That will always be my niche and my favorite milieu. I’m comfortable with that, because it’s what I love. At the same time, I have lots of other interests. Some of them are passing fancies. Some get pursued. Some don’t. 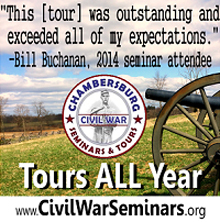 One of my longtime fascinations is with the Battle of Monocacy. J.D. Petruzzi and I were well into researching a book on the topic, but a barrage of four books were published in a short period of time about this important campaign, and any potential market for such a project dried up. That was the end of that. However, I continue to be fascinated by this battle, and I still gobble up everything that I can on it. I have other projects where I have invested substantial time, money, and effort and then lost interest. I have gathered a vast amount of material on the Wilson-Kautz Raid of 1864–much of it rare and never seen before–certainly enough to do a book-length study of it, but I’ve just lost interest in it. It doesn’t interest me enough to invest the time and energy into actually writing a full campaign study on it, and I doubt I will ever do so. So, I’ve got tons of files on it that I doubt I will ever use. The Jenkins-Imboden incursion into Pennsylvania before Gettysburg is another good example of the same thing. Again, I have tons of material that I doubt will ever get used by me in any substantive project. All of this is part and parcel of my ongoing struggles with ADD. I just have a short attention span, and things either grab it or they don’t. I write about what interests me, so whatever project I tackle has to REALLY interest me, or I won’t bother with it. I grew up a few blocks away from a street called Garfield Avenue. There were two streets named for former presidents in our neighborhood, Garfield Avenue and Cleveland Avenue. I knew Grover Cleveland had served two terms as president and was known for his girth. I knew almost nothing about James A. Garfield other than that he was assassinated a scant few months into his presidency, so I set out to learn a few things about him. Along the way, I learned that he was a veteran of the Civil War. After researching him a bit, I determined that was really a unique guy–he was a battlefield veteran who resigned his commission to become a very powerful and influential Radical Republican Congressman. I knew that he had a great deal of influence of Maj. Gen. William S. Rosecrans’ ill-advised decision to leave the battlefield at Chickamauga. Finally, Garfield was an Ohioan. He was born here, he lived here, and he is buried here. That makes researching his career a bit easier because the resources are nearby. The Middle Creek battlefield, where Garfield won a critical early 1862 battle that cleared Confederate forces out of eastern Kentucky, is only a couple of hours away. After reading the very good book Destiny of the Republic: A Tale of Madness, Medicine and the Murder of a President, I looked and saw that there really has been no monograph that focuses exclusively on Garfield’s very unique role in the Civil War, which surprised me. A volume of his letters to his wife Lucretia during the Civil War was published in the early 1960’s, and his diaries were published in the late 1970’s, but that’s it. 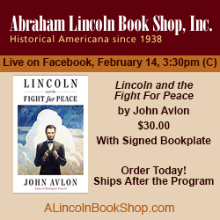 All other books–understandably–focus on his unusual election to the presidency, the tragedy of his wounding at the hands of a lunatic, and his unnecessary death due to medical malpractice of the worst variety. By contrast, two other Ohioans who occupied the White House who were Civil War veterans–Rutherford B. Hayes and William McKinley–have had books written about their service in the Civil War. Hence, the lack of any monograph about Garfield’s important and unique service in the Civil War seems to me to be a gaping hole in the historiography of the war. Consequently, after much thought and after discussing the idea with a number of professional historians to get their input, I have decided to tackle this project. It is something very different for me, but the deeper I get into it, the more fascinating I find the project. Consequently, I have begun gathering material and intend to pursue this. I will keep everyone posted as the project proceeds, but I’m more excited about this project than any other history project that I’ve tackled in quite a while. Good luck with the project on Garfield. I must admit I wish we could get your version of Monocacy. The other books are good but imagine yours would have been unique and a likely favorite of mine. Thank you for that, Jim. With four books being published on the campaign in about an 18 month period, which is how it played out, no publisher wants to touch it, figuring enough is enough, and how much room can there be for another book on a subject that has just had four different books published on it. One of those books–Leepson’s–sold quite a few copies, and they’re all scared off by that. Perhaps it’s something that can be revisited later, but now is definitely NOT the time for it. I’m as disappointed as you are, because I love that battle. My second article was on it, way back in 1993–that’s how far back my interest in this subject goes. Middle Creek here we come! Anything about the CW in E Ky in 61-62 will have my interest! Go for it. Eric, weren’t you contemplating a work about Morgan’s raid into Ohio? I’d be interested in that. After doing the research, it just doesn’t interest me enough to motivate me to put in the effort to write a book-length study. 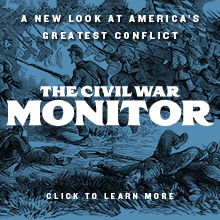 Sorry…..
A look at Garfield in the Civil War would be fascinating. Peskin’s biography was very good for his overall life and your focus on his Civil War years would improve on that book and the book that came out a few years ago by James Perry that included Garfield when talking about Presidents in the war. Eric, I’ll look forward to this one as well. I think I remember reading that you and J. D. were working on a 3-volume set on the cavalry operations at Gettysburg. Is that still in the pipeline? Sounds like a fascinating project, Eric! 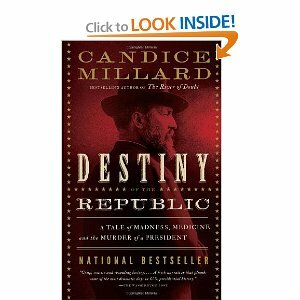 I just finished Destiny of the Republic and have always liked to read about Garfield. I would love to read about him in the war too. Seriously, this would be a great project. 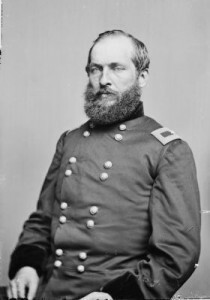 Garfield’s influence is significant, both in congress and as as the Army of the Cumberland’s Chief of Staff in 1863. His relationship with Rosecrans is also quite interesting. Garfield never commented on or critized Rosecrans in public, but plenty of other people discussed the fateful moment at Chickamauga, even before Garfield’s presidential campaign. I just visited Garfield’s home in Mentor, and his gravesite in Cleveland. Very cool. Any help I can be, let me know. It is interesting that you mention the Rosecrans-Garfield relationship which I also find critical and fascinating. I thought Margaret Leech in her book ‘The Garfield Orbit’ had a very good account of it in the chapter on Garfield’s war activities in 1863. She was fair and critical toward both sides. It’s a really nice summary of the relationship and its effects in 30 pages.